We’re excited to announce B.L Duke has grown! Over the last six months we’ve added 28 employees, 10,000 tons per month and a 25-acre scrap yard in Joliet. This new yard increases our sales territory and offers additional competitive advantages. “The Joliet yard expands our service range south and west of the Chicago metro area. With logistics being our biggest expense, the second location now allows B.L. Duke to be more competitive in this region,” says B.L. Duke’s VP of Sales, Marissa Plucinski. With the addition of two of the largest ferrous balers in the region, we’ve tripled our baling capacity to over 1000 tons per day. Conveniently located on the Des Plaines River and equipped with two barge docks, dual balers and two CN Direct rail spurs, B.L. Duke is the only scrap metal company in the Chicagoland area servicing industrial customers with balers and barge access. These resources allow B.L. Duke to drastically decrease transportation cost and market materials to both domestic and international markets. With a focus on transparency and responsiveness B.L. Duke has complemented this expansion with the roll-out of new GPS logistics technology. B.L. Duke is arming drivers with tablets that enable customers to track real-time pick-up information, pictures and load details. We are grateful to our customers who partnered with us through the downturn. B.L. Duke is committed to revolutionizing the recycling industry while sticking to our core values. Our growth can be attributed to our willingness to innovate, focus on new technologies and emphasis on safety and efficiency. For a fresh look at your recycling program, contact B.L. Duke at 773.778.3000 or info@blduke.com. In a recent interview with American Metal Market Daily, B.L. Duke President Lou Plucinski discussed the advantages that small- and mid-size scrap metal companies like B.L. Duke experience during down markets. He attributes his company’s recent success to the company’s size and agility. “Being our size allows us to be more flexible to our customers. We can go anywhere fast. Mill demand changes fast, and being able to be flexible in shipments and grades helps mills as well,” Plucinski said. Plucinski also discussed the impact that the recent drop in ferrous scrap prices has had on the industry as a whole. B.L. Duke’s edge through the downturn was attributed to taking a fresh approach within the industry. “We know the stigma scrap metal companies have, and B.L. Duke is truly revolutionizing the industry because we have brought a new level of transparency with customers with groundbreaking software systems that allow customers full access real time,” said Plucinski. Read the full article, Small Yards Have Edge During Downturns, Exec at www.amm.com. B.L. Duke delivers customized recycling programs with game changing efficiencies. Established in 2000, we’ve integrated recycling, logistics and demolition to deliver programs that streamline operations. Learn more about B.L. Duke at www.blduke.com. For a fresh look at your recycling program contact B.L. Duke at 773.778.3000 or info@blduke.com. We’re more than excited to announce that B.L. Duke was chosen as one of Crain’s 2015 Fast Fifty Companies! Every year, Crain’s releases their infamous Fast Fifty list, which recognizes companies that have shown significant growth over a five-year period. The list includes Chicagoland companies from the IT, Healthcare, Construction, Transportation and many more industries and we’re honored to be the only company representing the recycling industry this year. When Lou was asked what is currently spurring our rapid growth, he explained without hesitation, our sales and operations staff. B.L. Duke has been successful at acquiring new market share but even more successful at retaining it. We can only attribute that to our team creates great relationships and delivers on what we promise. B.L. Duke’s team is revolutionizing the recycling industry. We’re committed to evolving our practices as the industry needs change. We recently invested in the latest technology in scrap management which creates a new level of communication and transparency with our customers. For a fresh look at your recycling program, contact us at info@blduke.com or call 773.778.3000. Whatever the scope of the task at hand, B.L. Duke is dedicated to providing a solution for our customers. On October 17th, 2014, B.L. 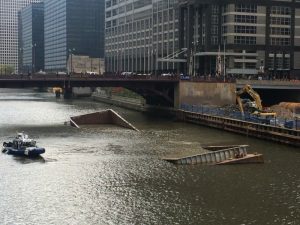 Duke was contacted by a long time customer to salvage and recycle a construction barge that had broken in half and sunk in the Chicago River. The 200′ long barge was being used to haul clay from a high rise construction project before it sunk in the West Loop between Lake and Randolph street bridges. As the General Contractor, B.L. Duke’s main goal was to safely raise the barge from the bottom of the Chicago River and transport it to a dry dock to be cut up and recycled. The endeavor was a coordinated effort that included Clark Construction, Ozinga, Thatcher Construction and Roy Strom Trucking and Excavating. Understanding the urgency of the situation, these great Chicago establishments leaped in with both feet, immediately allocating resources to the project. The US Coast Guard and Chicago Police Marine Division provided assistance with coordinating commercial and pleasure boat traffic safely around the wreck site. The Army Corps of Engineers and the USCG Salvage Engineers in Washington D.C. consulted on the salvage plan and issued permits for the operation. This was an extremely time sensitive operation. Not only was the barge blocking the way for commercial traffic on the Chicago River, the O’brien locks on the Cal Sag was scheduled to close for reconstruction the 1st week of November. This closure would block the only other waterway connecting Lake Michigan with The Chicago River, The Illinois river and ultimately the Mississippi. B.L. Duke will process and recycle over 550,000 lbs of scrap metal. To learn more about B.L. Duke’s recycling programs and value added services, contact us today.